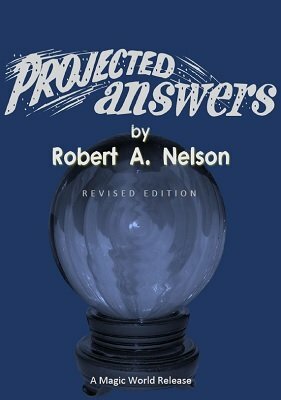 The first and only book on the technique of "projected answers to questions!" Learn the professional mentalist's secret of projecting or carrying the replies to questions. Don't just provide a simple answer or restate the question. Use Nelson's projection technique to turn an ordinary Q&A act into a masterpiece. Not only does the spectator receive an answer to her question, but she is given a bonus in the form of additional information pertaining to her question, plus other predicted events. The spectator is doubly intrigued at this mysterious source of information. Other spectators become eager for answers to their questions and additional information pertaining to their future. These subtle and unexpected flashes of additional information strengthen and intensify the effectiveness of the entire act. In this outstanding ebook, Nelson - a professional psychic entertainer as well as a respected author - explains in detail the "projection technique," shows you how to apply it, and gives abundant actual examples and patter lines. Enhance your reputation as a mentalist, which means higher fees for you. This text, along with Sensational Answers , Effective Answers to Questions and The Art of Cold Reading , together constitute a complete, professional level course in bringing the mentalist to the highest level of proficiency in the answering of spectator or sitter questions. Priced within the reach of even the beginner or amateur, with information that will benefit even the most seasoned worker. Are you a Nelson collector? This was Item Number 639 in the Nelson Enterprises catalog . Now you can fill that missing spot in your collection. 1st edition 1956, PDF 43 pages.